NSC Velodrome stands for National Sports Center Velodrome located in Blaine, Minnesota, U.S.A. Since National Sports Center did such a good job in explaining the details of NSC Velodrome Track Specification, I decided to repost the entire article on my blog for educational purposes. Velodromes are steeply-banked oval cycling arenas. The prefix “velo” is short for the French word “velocipede”, the bicycle’s original name. The purpose of the track’s design is to provide racers a smooth predictable surface on which to maintain the highest speed possible. All velodromes are not the same, some have very gentle banking, and others are very steep. And although all are oval, some are elongated, with sharp turns, while others are almost round with short straight-aways. The NSC Velodrome is 250 meters long with 43-degree banking in the corners and 15-degree banking in the straightaways. Velodrome tracks are constructed from a variety of materials, including concrete, cinders, wood – and in the early days, grass. 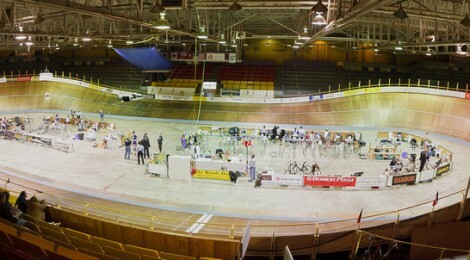 The NSC Velodrome is one of only three outdoor wooden tracks in the US. It is made of 42 miles of ultra-durable African Afzalia wood. The NSC Velodrome was designed by the world-famous Schurmann design team from Germany. A unique part of the design is the orientation of the surface boards. The 4cm X 3cm boards are laid narrow side up so that riders race on the edges of the boards, not the wider surfaces. All velodromes have lines painted on the track’s surface. The “cote d’azur” or band of blue, marks the tracks inside boundary. Racers may not ride on or below this wide band, except for emergencies or during the slow tactical maneuvering during match sprint competition. The black “measurement line”, as the name implies, is used to measure the distance around the track. The thin red line around the track is the “sprinters line” and it defines the sprint lane between the red line and the blue band. A leading rider in this lane is said to “own the lane” and may only be passed by a rider going over on the right. The uppermost thin blue line is the “stayer’s line” or relief line. It marks the boundary between faster and slower traffic, with the faster riders below the line while the slower “relief” riders are above this line during Madison races.